I have been growing tomatoes since I was 16. I have grown tomatoes in the Netherlands and in Wisconsin and I have never experienced anything like this. On Thursday I walked into my vegetable garden and one of my tomato plants was wilting. I am not talking a bit of heat stress, but full fledged, utterly clogged vascular system. It had been a very robust plant, so this came as a total surprise. The next day, that was yesterday, the plant was dead. It looked like it was going to rain so I made the heart wrenching decision of taking out the entire plant because I did not want this to spread to the other plants, mine or the neighbors, or the nearby farms. The plant that died was an “Early Pick”. Well, at least if was not one of the heirlooms. It was tough; it had just started to produce red tomatoes. Instead, I now have a gigantic bowl of green tomatoes; the memory of something that could have been. I sprayed the other tomatoes with copper fungicide, just in case. I disinfected my pruners, my clothes and gloves went into the laundry and I hoped that was the end of it. 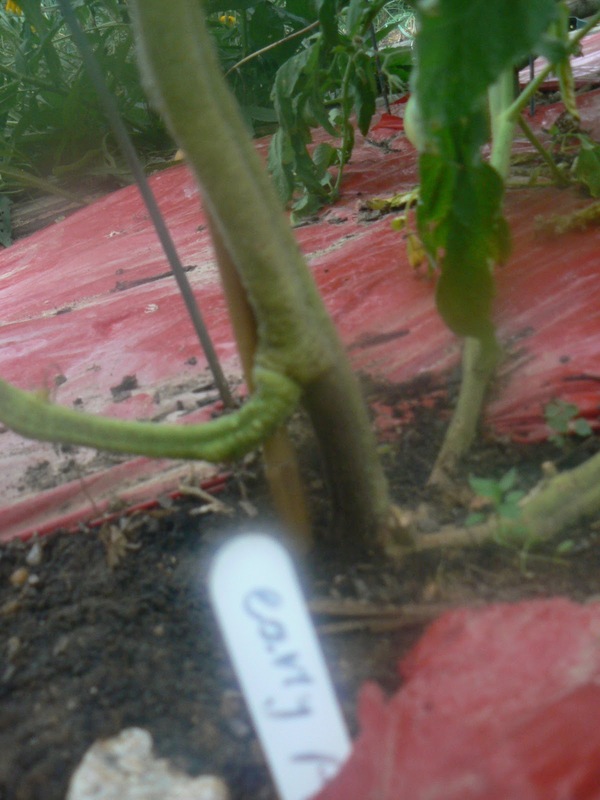 I had noticed a very dark area on the main stem of the tomato plant, right where the plant and the soil meet. I figured that would have to be the culprit. The disease that was making it impossible for my plant to absorb any water. I guess it Fusarium or Verticilium Wilt. All the other plants looked healthy and happy, so I was hopeful. Today I walked into my garden around 1 pm. I got a sickening feeling, because now my heirloom “Cherokee Purple” was drooping. By 7 pm it was dead; same lesion at the bottom of the stem. I did not have time to remove this plant. Actually, I was simply in denial. Should have been ruthless because now it is raining. The question is, will I have the heart to walk into my vegetable garden tomorrow? Fusarium wilt- wilting starts at bottom of plant and moves up. Brown streaking of vascular tissue can be seen when you slice back the epidermis of affected stems- http://plantdiagnostics.umd.edu/level3.cfm?causeID=1354. Southern blight- causes stunting/wilting. Lower stems have significant brown lesions above and below soil level. Worse during hot, wet weather. The tell-tale sign are tan fruiting bodies the size of mustard seeds growing on lesions- http://plantdiagnostics.umd.edu/level3.cfm?causeID=1355. Verticillium- wilting starts at the top of plant. 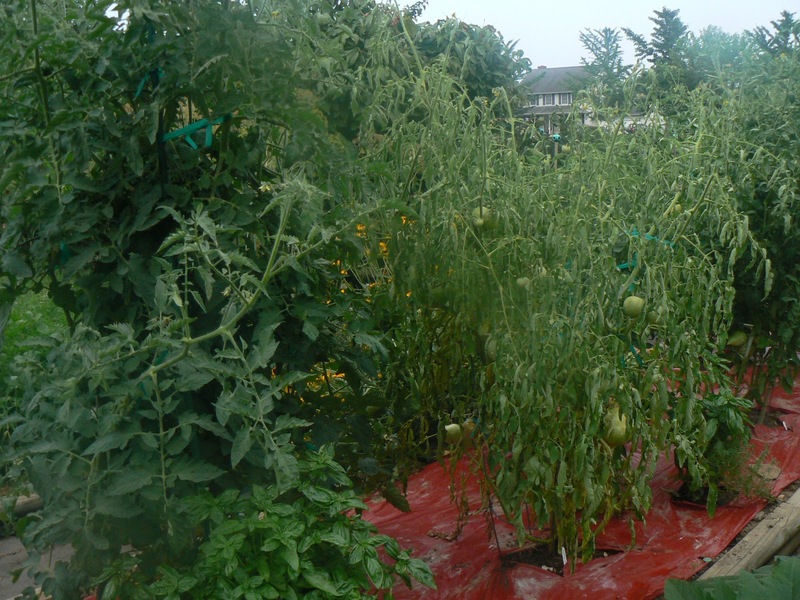 Observed less frequently on tomato in MD compared to the first two diseases. 'Early Pick' is advertised as having resistance to Verticillium and Fusarium (although it's not clear which races). I guess it is Southern Blight. I have been reading about it and it fits the profile. Plus that bed had a cover crop of Crimson Clover over the winter. Not sure what I am going to do in future years since Southern Blight has such an enormous host range. Remove roots and all of the infected plants. This disease will take out herbaceous perennials and herbs if conditions are right but you won't necessarily see it next year. Already done. Bag is standing at the curb; pick up is tomorrow.